Ubuntu 13.10 Saucy Salamander is going to be released on October 17th. I’ve installed the final beta on my laptop. If you’re not comfortable with Ubuntu’s default window title buttons (minimize, maximize, close) location, you can easily move them to right via following steps. 1.) 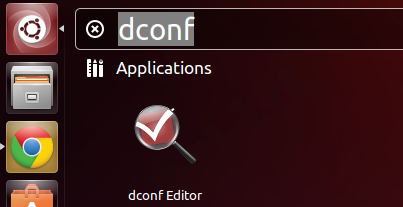 Go to Unity Dash, search for and open Dconf Editor. If not exist, install it from Ubuntu Software Center. 2.) When it opens, navigate to org -> gnome -> desktop -> wm -> preferences. Note that “System Settings” > “Unity Tweak” > “Tweaks” > “Window” > “Window control button position” > “Right” will also set this to “:minimize,maximize,close”, but the above method is more powerful as one can add in the very handy system menu icon (invoked via keyboard by alt+space) as well by setting “button-layout” to “menu::minimize,maximize,close”. Does this work for Ubuntu 14.04 with Unity?? Nope. No way to move window buttons in Ubuntu 14.04 Unity so far. This work in Ubuntu 14.04 if you use the Unity Tweak Tool. will do the job in command line. no extra tools necessary. put “:” in front to have buttons on the right and put “:” after “close” to have them in the left corner..